This article is about a project called “Leap Year Finder” which is done in C++. This project will help you to develop a basic C++ console application with Visual Studio 6.0. This project is about calculating whether the given year is leap year or not. 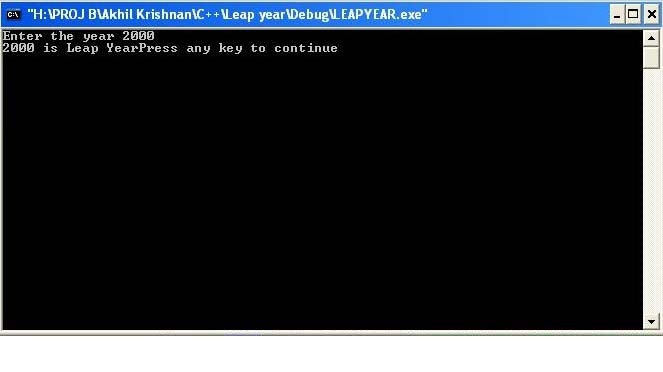 Inputs are taken from console window and output is generated using leap year equation. This project upgrades the VC++ 6.0 project to Visual Studio 2005 project. Some of the used features and classes of C++ in this project are: Win32 Console Application, console Application, Cin, Cout, Visual Studio 6.0, Visual Studio 2005, Mathematics.